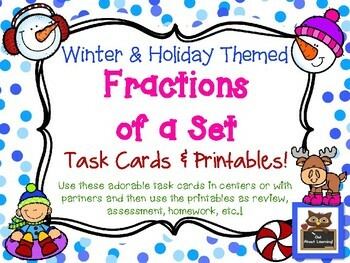 Winter and Holiday Themed Fractions of a Set Task Cards and Printables! 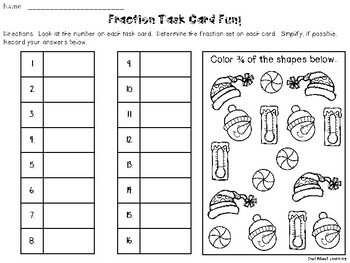 Here is an adorable and colorful task card math center for you to use each winter and holiday season! There are 16 task cards with a recording sheet for your students to record their answers. 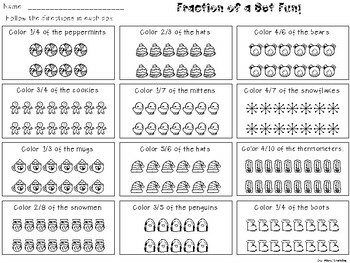 I've also included two different worksheets as a follow up, homework, assessment, etc. Please click on the preview button above to see the product in its entirety! I also have a similar product with a Fall/Thanksgiving theme. If you purchase and download this product and have any ideas or suggestions of ways to add to it, please do not hesitate to contact me so we can collaborate together to meet your students needs! I can be reached at owlaboutlearning@outlook.com.